George looks rather funny now, we couldn't get the shears through the wool on his top knot, nor the wool under his chin. I knew he was small but, wow! George is the biggest lamb to ever be born at Rockin' T, and he is the smallest adult sheep we own. He was born last year to a rather small ewe weighing in at a whopping 17#! The poor ewe didn't live through it, but I decided to wether George and keep him for his wool. Believe it or not, these are all this years lambs; except for the bald one to the upper right. That would be George. This is George's fleece, about 4.5 lbs of it. Not sure if I am going to try to do this one myself or send it off to Sherri at Morro Fleece Works. I couldnt resist washing a small sample, and will have to spin it up as soon as its dry, if I can put Babs' fleece to the side for a minute, I am still enamored with it too. If you click to biggify, I think you will know what I mean. Both these fleeces are hoggets (first shearing) and are totally delectable! So, two down, three to go! Will do the two other rams next weekend, then Gracie, the new romeldale cross, the next weekend. 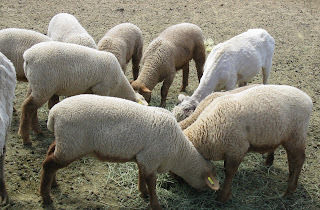 Wow, what great looking fleeces. 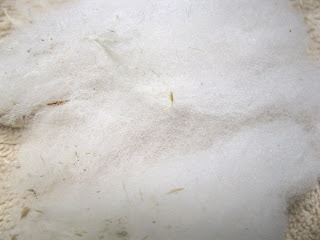 Your sheep are doing a wonderful job of making fleece this year. I think everyone one has a George sheep you, me, Sharon, except my George (K.G.) is the largest of my shetlands! Oh wow - that is lovely. I haven't even started to look at what we sheared this year. I'm just trying to get through the countdown to the big blissful ahhhhhhhhhhhh. BTW, Sherri does a terrific job. What kind of sheep is George? 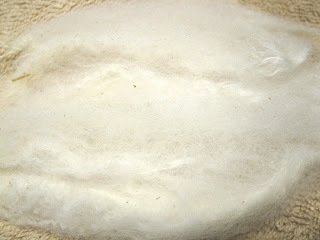 The wool looks soft and very lustrous. What does the term Locker Lamb mean?